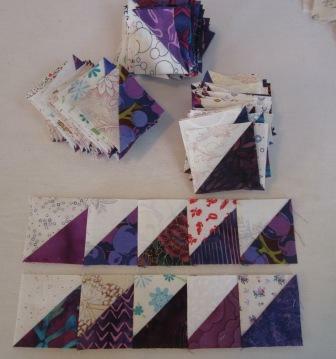 I got some purple scrap sewing done on Saturday. These are only part of the 600 purple triangles I need for Roll Roll Cotton Boll. This step is going to take for every. They are so very cute. Many little piles of many little triangles. I got to use some very old and special fabric, and some not so old. One of the fabrics was in a maturity dress I made some 15 years ago. I have added this to SoScrappy Rainbow Scrap Challenge 2012. I am just loving this challenge. I have big news today. My quilt Bouncy Ball got a 2nd place at Quilt Canada in the National Juried Show. I just found out about it and had to tell you. It is the Greek Square blocks I started to make at the beginning of this challenge. I loved it so much I kept sewing till it was done. My box of purple scraps. 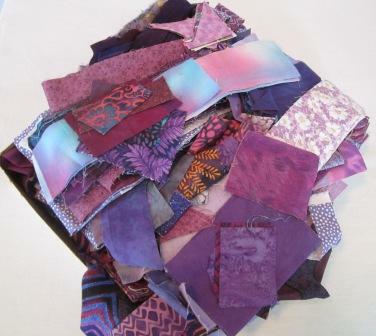 I have many lovely purple batiks in here still to use up. Next I will work on a block or two for my Farmer's Wife sew-a-long. I must call it Forester's Wife. Congrats on the win for your Bouncy Ball quilt! Love your purple scraps - can't wait to see your RRCB! I love purple fabrics Cathy- you do get lots done- very pretty quilt with lots of memories in it.. I will look forward to seeing how you progress with it.. I love your purples - so very pretty! I am participating in the sew-along too, mine is called the Engineer's Wife! Congratulations on the win - your quilt is gorgeous. How exciting! Congratulations. It is a fabulous quilt! So happy that the challenge inspired such a great project. Keep chugging along on RRCB. Though it has a lot of pieces, it is worth it in the end. Congratulations Cathy. Very exciting on your win. Your purple half squares are great and love the bouncy ball. The colors are bright and wonderful together. Congratulations on your ribbon! Congratulations! That is such great news and well deserved for a fabulous quilt! Great idea to use the scrap challenge to make progress on your RRCB. That is SOOOOOOOOOOO exciting, that you got a win on your quilt!! Congratulations!! I love your purples. And I recognize at least one of them that has been in my stash at one point over the years.